Comedy legends Bud Abbot and Lou Costello perfected their most famous routine ever, "Who's on First?" in The Naughty Nineties. Set in the 1890s, a ham actor (Abbott) and his dim-witted assistant (Costello) set sail on the Mississippi showboat, the River Queen. When the boat docks in St. Louis, the boys try to rescue Captain Sam (Henry Travers) from a poker game with three card sharks but are too late. The gamblers win a controlling interest in the River Queen and – to Captain Sam's dismay – set up a crooked casino operation on board. 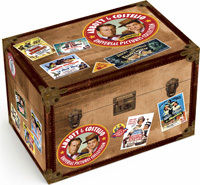 As the duo attempts to rid the showboat of the villains, they find themselves in a series of hilarious missteps that showcase some of the most hilarious moments ever captured on film!